Welcome to another in our series of interviews with the organizers behind Death Salon. Each subject was interviewed by a fellow organizer or event coordinator. Here you will learn more about each participant’s contributions to the Salon, their own fascinating body of work and more about Death Salon itself. 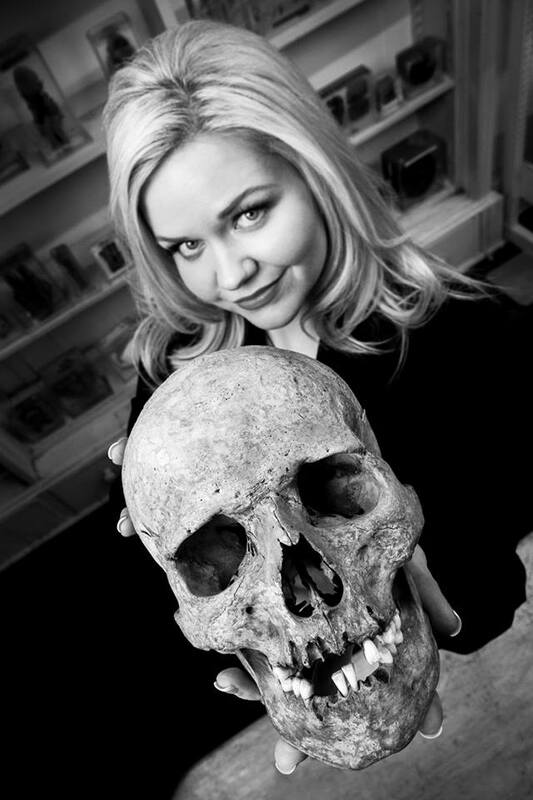 Lindsey Fitzharris is a medical historian who completed her doctorate at Oxford University with a specialty in the history of seventeenth-century alchemical pharmacopeia. Her interests are broad and cross boundaries–more interestingly, she has helped to make medical history and medical artifacts accessible to a broad audience. Her current work includes the film documentary Medicine’s Dark Secrets! I have asked her to give us a few details on her present work, and to share with us her plans for the future and her role in Death Salon. Welcome, Lindsey! You are, I know, a multi-faceted researcher with diverse interests. What brought you to Death Salon? For years, I’ve been writing about subjects related directly or indirectly to death and dying on The Chirurgeon’s Apprentice, a website dedicated to the history of pre-anesthetic surgery. I am also about to begin filming a television documentary called “Medicine’s Dark Secrets.” At its core, I want to explore the development of early modern surgery by telling the stories of the people who died and the surgeons who cut up their dead bodies in the 18th and 19th centuries. Our medical heritage can be dark and macabre, but it’s important to acknowledge what went on in the past, and how it contributed to our understanding of human anatomy. It’s through these projects that I came to know Caitlin Doughty, and was invited to become a member of The Order of the Good Death. From this community of scholars, artists, musicians, writers and funeral directors, the concept for the Death Salon was born. Do you think an organization like this one is important? How and why? As a medical historian, I am acutely aware of the fact that we interact with death in very different ways than people interacted with death in the past. At the moment, I am in the process of writing an article on Kate Granger, a 31-year-old doctor who is dying of a rare form of cancer. We’ve discussed everything from concepts of the “good death” to whether or not dying has become over-medicalized in Western culture. These are subjects which will also be explored at the Death Salon. For me, it is important that we open up a dialogue about mortality so that we can begin to accept (and own) what ultimately is our collective fate. Spoiler alert: Death plays a big role in the ending! Given your work, how do you see yourself fitting into Death Salon? Well, given my strange occupation, I don’t fit into most organizations in any obvious way! I suppose the one thing I can offer, though, is historical perspective: a sense that our struggles with death and our fears of dying are nothing new. I find a lot of comfort in this thought. How might the “salon” style of the organization benefit broader outreach? For me, this is the appeal of the event as it allows us to draw from all kinds of people, each of whom provide a different perspective on the subjects which we’ll be exploring at the Death Salon. How a musician like Jill Tracy, for instance, interprets death is going to be very different to how someone like Jeff Jorgenson—owner of Elemental Cremation & Burial—tackles the subject at the event. I’m really looking forward to hearing from the participants, and seeing how their work will inspire me in my own writing. Where do you hope to see Death Salon in the future? I think the opportunities are endless. I hope to see events such as this spring up all over the world. In fact, I am currently talking with Carla Connolly—the curator of Bart’s Pathology Museum in London—about potentially organizing a Death Salon in the UK in 2014. I don’t see the Death Salon dying off anytime soon. Ah, always end an interview with a strong joke. –Thank you, Lindsey! We look forward to seeing you at the Salon! Brandy Schillace, PhD, is the managing editor of Culture, Medicine and Psychiatry, an international journal of cross-cultural health research. She is also the author of the Fiction Reboot and Literary Medicine’s Daily Dose blogs which can be found at bschillace.wordpress.com . In addition, Brandy the Guest Curator for the Dittrick Museum of Medical History.